We are committed to providing the best general dental care to Eugene-area residents in a friendly, comfortable atmosphere. Here at the general dentistry practice of Kirt Kirchmeier, DMD, your family dentist in Eugene, Oregon, our mission is to have our patients trust in us to provide them with state-of-the-art dental care at the highest possible skill level in order to help them maintain optimal health. We are committed to providing the best general dental care to Eugene-area residents in a friendly, comfortable atmosphere. We are happily accepting new patients and welcome you to our practice. We want to be the best dentist Eugene, OR has to offer. Dr. Kirt Kirchmeier and his team offer complete general and cosmetic dentistry services, ranging from routine oral examinations and cleanings to dental implant restorations, wisdom teeth extractions, and dentistry for kids, as well as bridges, dentures, crowns, tooth-colored composite restorations, and teeth whitening. Complete family dentistry, children’s dentistry, and dental services including dental exams, X-rays, teeth cleaning and dental composite fillings. Affordable cosmetic dentistry and dental cosmetics, including teeth whitening / teeth bleaching, cosmetic dental surgery, porcelain veneers, smile makeover, dental composite fillings and other cosmetic dental procedures. Emergency dental work, including wisdom teeth, tooth extraction, root canal therapy, emergency dentist treatment and immediate dental care / urgent dental treatment. Periodontist services, including gum disease treatment, scaling and root planning, soft tissue management and oral hygiene instruction. Restorative dental services, including chipped tooth repair, composite tooth colored fillings, dental bonding, dental crowns / tooth crowns, dental bridges and dentures. Oral Surgery services including, implant dentistry / dental implants surgery and tooth implants, extractions and wisdom tooth extractions. Dr. Kirt Kirchmeier shares his passion for dentistry with each patient, making every dental appointment as pleasant and informative as possible. Deciding to be a dentist during childhood, Dr. Kirchmeier strives to help each patient achieve optimal oral health through building strong relationships and providing state-of-the-art dental care. This combination helps maintain healthy bonds and smiles that last a lifetime! The friendly, supportive staff at North Eugene Family Dental supports the community in a variety of ways. From their shared passion for excellence in dentistry to enjoying the great outdoors in the greater Eugene area, you can find each team member involved in supporting University of Oregon athletics as well as outdoor activities such as hiking, fishing, skiing and water sports. Let Dr. Kirchmeier provide you with the best possible dental care in the Eugene, Oregon area! 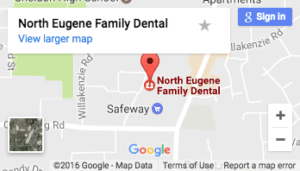 North Eugene Family Dental is conveniently located in Eugene at 2550 Willakenzie Suite 3, just across the street from Sheldon High School. Please call us at 541-343-5512 for your personal appointment.